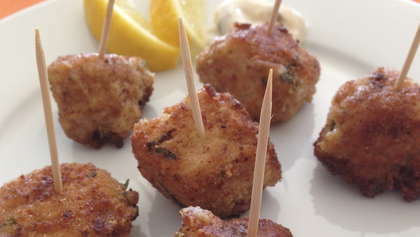 These tasty fish bites are perfect for a quick meal with the family. Rinse and pat dry fish. Cut into 1” squares. Arrange 3 medium disposable bowls. Bowl 1: Mix breadcrumbs, salt, parsley, and Old Bay. Bowl 3: Egg whipped with fork plus water. Preheat small pan over medium low heat with oil and butter (in small batches - 1/4 at a time). Using a fork, tongs, or one hand only (keeping second hand clean), dip fish bites into flour, then egg mixture, then breadcrumb mixture. Carefully place fish cubes in pan and turn until each side is golden brown and fish is cooked through (flakes with a fork). Place fish bites on paper towel to drain. Stab with tooth picks. Serve with cut lemon and/or tartar sauce and/or ketchup.